2-year-old Buddy 50 that has sat for a few weeks. It has gas, and sits on a trickle charger when not being ridden. I use only Ethanol free gas (rec fuel). The bike had service @ 1,000 miles, and has 1,500 right now. There is a reference in the manual to a fuel draining device, but if my bike is equipped this, I don't know where this is. I removed the panel at the bottom of the seat/luggage compartment, and it doesn't look like this. I live on an island, and nearest place to get help is not close, nor do I have an easy way to transport it, so best if I can do this myself. I am not especially mechanical, but can follow directions. I wouldn't expect ethanol-free fuel to go bad in just a few weeks, because (according to my very simple understanding) ethanol is the main culprit for absorbing moisture and thus causing problems like this fairly quickly with regular gasoline. Given your humid location, though, there still might be some moisture in the tank. If I were you, the first thing I'd try is to add some Sea Foam to the tank to remove some of that moisture. You can likely find Sea Foam at a hardware or auto-parts store. Maybe start with about 2 ounces, but more than that won't hurt. Thanks John. I am going over to Walmart today, so will look. What chance do you think this is the battery? That seems an easy enough thing to replace myself. If the battery needed replacing, I don't think the starter would sound that strong. Does your trickle charger indicate the amount of charge? A Battery Tender, for example, will flash a green light when the battery is charged above 80%, which should be enough to start the scooter, and a dead battery likely wouldn't reach 80%. And if there were no other issue, it should be possible to kick-start it even with a dead battery. The starter and battery sound great. That is the sound of an engine that isn't getting fuel or spark. No reason to think the relatively fresh fuel is the problem so I wouldn't expect SeaFoam to help, although a couple of shots in the tank won't hurt. I'd make sure the spark plug is well-connected to the plug wire, that there is fuel in the tank (of course), and dare I say that the kill switch and key are in their proper positions for starting? I'll say what everyone else is to polite to say. Please change the title of this thread to "My Buddy 50 turns over fine, but won't start", and you might get more helpful replies. A quick and dirty way to get a stubborn buddy 50, or roughhouse 50 to start, is to manually choke the carburetor. Take the airbox cover off, and remove the filter inside. Look for the hole leading to the carburetor (Left side of the airbox, on the back wall of the airbox, made of rubber). While cranking the engine, plug this hole with your thumb. When you hear the engine cough and try to start up, remove your thumb and apply throttle till the engine revs up. After this, reassemble the filter/airbox, and ride it around the block a few times till it's worked through the gunk. I'm not so smart about things mechanical, but it doesn't turn over. I did change it, to now say "Doesn't Start." @Johnk I did get some Sea Foam and put it in, kept it on the charger, and let it sit overnight. Still the same. I tried about 10x. I put some more Sea Foam in and will let it sit again. What do you think the next steps are? What about kick starting it? Not saying that your electric starter isn't working, but give that a try just to see what happens. I'm a little green about this. I kinda tried, but think I'm doing something wrong mechanically. 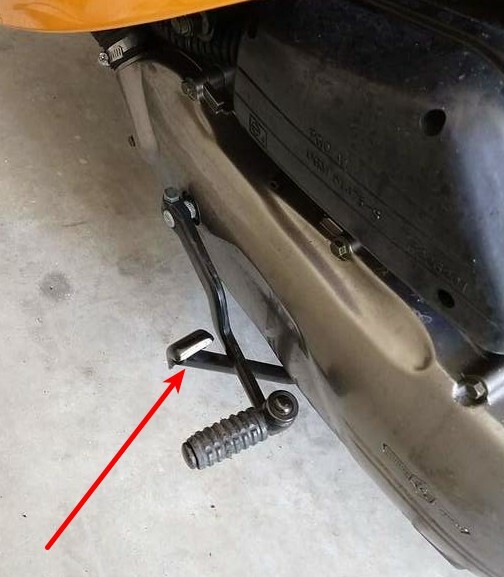 On my bike there is a lever of sorts beneath the kick start pedal. It seems that this is in the way, but maybe this is normal. In kicking this down I never hear the engine engaging. I have the key in on position. Is there something else that I need to do? That's your center stand. Get to know it, make it your friend. Fold the kick start lever in, put the bike up on that center stand, unfold the kick start lever. Set key to on, kill switch to run, and give the kick start a...well, kick. Do this by standing to the rear left of the bike, with one hand on the rear grab-rail. Set right foot on kick start lever, and step downwards briskly. As for your next steps, I always do what Stanza says! That image isn't for the Buddy 50, it's for a Genuine scooter with fuel injection. The fuel could still be bad in the carb. The OP will need to drain the carb to get good gas in it. If it was my scooter I would drain the carb, then try to start the scooter. It might take repeating this a few times to get good gas into the carb. Actually, I would probably start by giving it some starting fluid just to see if it will fire up. If you are lucky that might be enough to get some gas moving through the carb and maybe you wouldn't need to drain the carb. Kendoori.. I sent you a private message (PM). To read it, click on the link at the top right of this page that says you have a message to read.. much appreciated..
Newbie question. How does one drain the carburetor? Is there a video of this somewhere? How old is the fuel and when did the engine last run? Once you start messing with the carb you are introducing another dimension of possible error. I would not go there until you’ve confirmed the ignition system works (spark) and that the plug is connected and unfouled. I agree with the starting fluid approach. Generally speaking, if it starts, even if only for a second or two, then you have good spark and a fuel issue. If it doesn't, then you have a spark issue. Thanks all. Kickstarting worked today. I let it run for a while, but couldn't take it out for a ride, but will try tomorrow. Given that it started via kickstart, what should I do next? I have to think the Seafoam may have worked its magic. That's great to hear! Did you change or adjust anything else? When you ride it tomorrow, first try kick-starting it (to double-check that it can still be started), and then shut it off and try using the electric starter again. If the electric starter doesn't work but the kick-starter does, then you've got a bit of a mystery on your hands, because you've ruled out a dead battery (otherwise the starter wouldn't sound as good as it does in the recording), spark plug problems, and fuel delivery problems (otherwise the kick-starter wouldn't work). If this is your situation, I hope one of the Buddy experts here will know what to do. But if it starts reliably with both the kick-starter and the electric starter, then I think you're all set. Join my cult of not being totally sure whether or how Sea Foam might fix things, but trusting that sometimes it just will, somehow. Huh. Y'know, come to think of it I had a similar situation a few weeks ago when I removed my carb to see if the stock #35 or #38 slow jet should be upgraded to the #40 jet for better idling. Turns out, it already had that jet, and perhaps was stock in my '09 - go figure. Anyway, this was a good thing because the replacement I bought was for a different model of carb, so I put the carb back together. Then I proceeded to drain the battery trying to get it to start. With no other options at hand, I applied a couple of kicks on the kickstart and to my surprise she started right up. No problems since then with the electric starter, and I didn't need to charge the battery either. Maybe the starter motor doesn't provide enough vacuum to draw a full bowl of fuel into the carb. Did not cross my mind as a possibility until you got yours started that way too. I usually kick start as the battery is very weak on those 50's. TIP: hold the throttle open as you kick start. Tenders, if you ever need to take the carb off again for cleaning or whatnot, and the bowl is empty, you'll need to re-prime the carburetor. You can do this by kicking the engine over three to four times to start the fuel trickling down to the carb, or by cranking the engine on the electric starter for about four seconds. Once you've done this, let it sit for about 30 seconds, then fire it up as per normal. Thank you, Stanza. Not that it should happen often, but would you agree that the kickstarter is better for this? I drained the entire battery over the course of ten minutes trying to use the starter to prime, so I think next time I’ll stick with the kick! The trick with it is to get that bowl full, but also not flood the engine. Generally, you can do either way. Electric start for ten seconds at most, or kick it over about 6 times, then walk away for a minute. Let that gas get to the carb and settle, then it should (fingers crossed) fire right up. This is, of course, on a bike that's behaving itself. If there's other stuff going on, it'll be stubborn. That Seafoam is miracle stuff. Started the scooter up yesterday and today instantly (no kick start). Question. How often should I be adding this to the tank? I think it was the kickstarting, not the Seafoam. Feel free to give the credit to the Seafoam, but also credit it with keeping elephants away from your home and making the sun shine sweetly on your beautiful island. To continue keeping elephants away, you can add a shot or two of Seafoam to every other tank. I’ve run it, foolishly, in high concentrations in small amounts of fuel. This creates a lean condition and causes hesitation and backfiring. But I don’t think SeaFoam really does much in an ongoing basis. It is a solvent, but gasoline is a solvent too. Personally I have a few 5 gallon jerrycans of fuel in my garage with a small electric fuel pump. I treat each can with StaBil and use the fuel for the scooters, boat engine, power washer, snow thrower, and generator (if necessary). After about six months I pour whatever is left into my car’s fuel tank and refill the cans. One year the boat didn’t get launched and 20 gallons of fuel stayed in the tank for an extra season. I can confirm that StaBil keeps fuel usable in carbureted engines for at least a year. I'm glad your scooter's working again, Kendoori! But to answer your question, I like to add an ounce of Seafoam per gallon of gas at all times. Even if we can't credit it with fixing your recent issue, it's not snake oil. My local climate's humidity and extreme temperatures put me at high risk of getting moisture in my tank and getting my carburetor jets clogged, so I like Seafoam as a preventative measure. And if the Seafoam helps you feel like you're treating your scooter well, and in turn encouraging it to behave itself, keep it up. Hey all- newbie with a very similar issue. I’m going to try that trick to manually choke it, maybe use starter fluid a few times. Any other ideas? The plastic thumbwheel controls idle speed. When it is screwed all the way in, the idle will be super fast, so I’d suggest screwing it in all the way (gently) them loosening it about two full turns or 720 degrees. That is still probably pretty fast but that’s OK when you’re troubleshooting. When you have the carb apart you can probably see how screwing it in raises the throttle position a little, allowing a higher minimum amount of air and fuel into the throat of the carb. The screw near it controls air/fuel mix. I’m pretty sure that out is rich, in is lean. You get to a starting point with the air/fuel mix by gently screwing that adjustment all the way in, then backing it out 1.5 full turns, or 540 degrees. The textbook “proper” position is somewhere between 1-2 turns out. If she won’t start with these default settings, the carb may not be properly cleaned. To clean the carb you need to unscrew both of the center jets (idle/slow/pilot jet and main jet), boil them in detergent, ream them out with a fine wire, and confirm that you can see daylight through them. Then you squirt aerosol carb cleaner through the chambers they screw into and through every little hole you can see in the carb. If the carb is clean but still not starting, at this point I would confirm the presence of spark and compression. 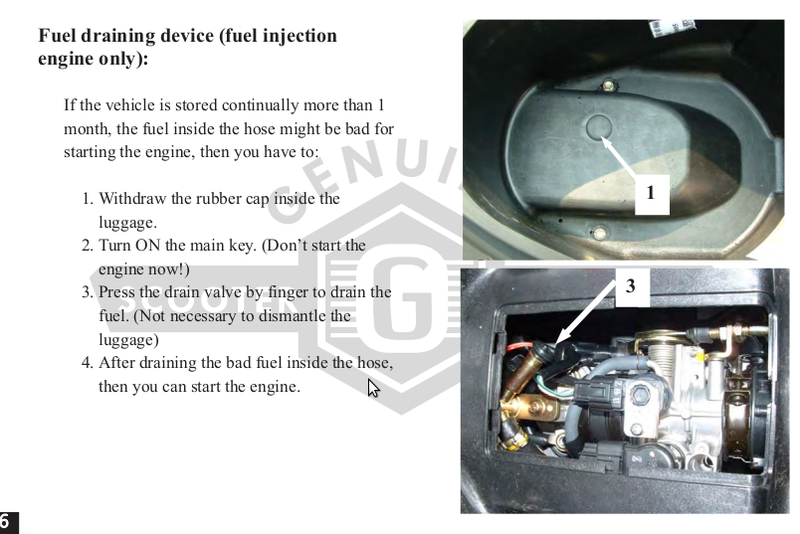 You check spark by removing the plug from the block, reconnecting the plug wire boot, holding the electrode of the plug near but not touching an engine ground, and cranking the engine. You should get a nice strong zapping spark. If not, the problem is with the CDI, wire, plug, or other electrical. You check compression with the plug out and a compression gauge screwed into the hole. Crank the engine and confirm at least 80psi. If not there is a problem with the rings or the piston. You can sort of check spark and compression simultaneously by removing the plug, squirting starting fluid into the chamber, quickly replacing the plug and wire, and cranking the starter. If the engine sputters for a few strokes, chances are you have spark and compression. Turning back to the carb, the next suspects are the needle valve, and the float level. The needle valve is an $8 replacement. If the plug was very wet when you removed it and there was fuel leaking out of the air filter box (which can be alarming), the float may be set too high so too much fuel is pooling in the carb base. You fix this, somewhat confusingly, by bending the hinge of the float UP a few degrees as you’re handling the removed, inverted carb, because the carb is upside down. Once installed right side up, this bending will make the float press up against the needle valve with less fuel in the bowl. Beyond this...maybe it’s time to throw in the towel and replace the carb. You can only do so much.